HEK293 whole cell lysate. 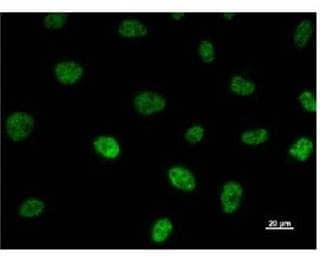 HeLa cell lysate. Purified using protein G chromatography from culture supernatant of hybridoma cultured in a medium containing bovine IgG depleted (approximately 95%) fetal bovine serum. Filtered through a 0.22 micrometer membrane. Our Abpromise guarantee covers the use of ab51026 in the following tested applications. WB 1/50. Detects a band of approximately 73 kDa (predicted molecular weight: 73 kDa). TAF6 is a subunit of transcription factor IID (TFIID). Initiation of transcription by RNA polymerase II requires the activities of more than 70 polypeptides. The protein that coordinates these activities is transcription factor IID (TFIID), which binds to the core promoter to position the polymerase properly, serves as the scaffold for assembly of the remainder of the transcription complex, and acts as a channel for regulatory signals. TFIID is composed of the TATA-binding protein (TBP) and a group of evolutionarily conserved proteins known as TBP-associated factors or TAFs. TAFs may participate in basal transcription, serve as coactivators, function in promoter recognition or modify general transcription factors (GTFs) to facilitate complex assembly and transcription initiation. TAF6 is one of the smaller subunits of TFIID that binds weakly to TBP but strongly to TAF1, the largest subunit of TFIID. Four isoforms have been identified but complete transcripts have been determined for only three isoforms. One of the isoforms has been shown to preclude binding of one of the other TFIID subunits, thereby reducing transcription and initiating signals that trigger apoptosis. Additional bands at: 105 kDa. We are unsure as to the identity of these extra bands. ab51026 was used at 5µg/500µg of RIPA lysate of HeLa cells. Western blot was labelled with ab51026 at 1/50 dilution followed by Mouse IgG antibody at 1/2500 dilution and developed using the ECL technique. HeLa cells labelled with ab51026 at 1/5 dilution. 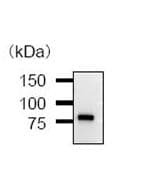 Alexa Fluor 488 Goat anti-Mouse IgG was used as secondary antibody at 1/200 dilution. Publishing research using ab51026? Please let us know so that we can cite the reference in this datasheet. There are currently no Customer reviews or Questions for ab51026.